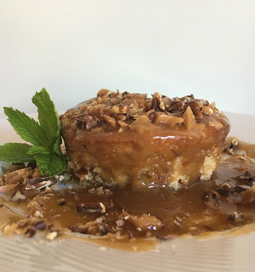 Sticky B.toffee Pudding - A recipe from Savor California, the online showcase for extraordinary gourmet foods and beverages from California. Butter and flour an 8-inch round cake pan OR 4 medium ramekins. Set aside. In a small bowl combine chopped dates and 1⁄2 cup boiling water. Set aside to soften for 10-15 minutes. In a separate medium bowl whisk together flour, baking powder and set aside. In a third bowl beat butter and sugar until light and fluffy, add eggs and beat well. Add date mixture and vanilla and mix well. Add batter to prepared cake pan or ramekins. Bake until toothpick inserted into center comes out clean, 40-50 minutes. Remove cake from oven. Poke holes all over cake. Pour B. toffee Sauce over cake. Sprinkle liberally with B.toffee Small Bites or chopped B. toffee. Cook ingredients over high heat until melted and then simmer for 15-20 until a golden brown color.